Avocado Salad can be made in plenty of ways. Avocados are very high in fibre and are known to lower cholesterol levels. The easiest and best way to include avocado in the diet is as a salad. 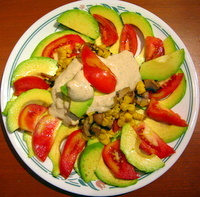 This avocado tomato salad is a very healthy salad recipe. I have added to it a quick saute of sweet corn and button mushrooms topped with a creamy but healthy mayonnaise. * 4 heaped Tbsp of healthy mayonnaise (garlic flavor) or any other mayonnaise. If using the healthy mayonnaise start with making it and store in the refrigerator a few hours or a day before. Heat a pan and add olive oil, garlic and onion. Saute till onion becomes soft. Add the mushrooms and corn. Saute till the mushrooms get cooked. Cook on a high flame so that all the water from the mushrooms evaporated quickly. Keep aside to cool to room temperature. Slice the avocado and tomatoes. Arrange on a serving tray. In the center, tip the mushroom mixture and top up with healthy mayonnaise.